4 pcs × 3 ml. Any Synthesis Oil, Natural oil, essence, perfume oils, Moisturizer and other liquids blends need this bottle in your makeup bags. Clear corrosion-resistant glass is thick, smooth and anti-shock protects essential oil from quick volatilization. Assorted size in package: 15 pcs × 10 ml; 5 pcs × 5 ml; 4 pcs × 3 ml. 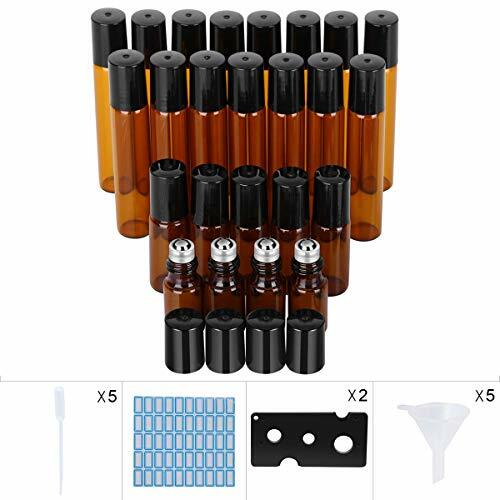 Useful gifts:5 Droppers, 5 Funnels, 2 Bottle Openers and 20 labels,which saves your money and time, make daily care more convenient. You can put it in your makeup bags or pocket. Moisturizing your body skin hair when it lacks water while having travel or going outside to go shopping, do sports and so on. Perfect for perfume oils, Moisturizer and other liquids blends. Made of clear corrosion-resistant glass thick, smooth and anti-shock prevent from quick volatilization . Our caps is tight that won't have leakage problem.With our opener, the bottle head can easily be disassembled and filled.The dropper and funnel allocate it while the label can distinguish it. The capacity allows you to store any Synthesis Oil, Natural oil, essence. Cobalt brown Glass Protects Against Harmful UV Rays. If you have any questions about this product by Tbestmax, contact us by completing and submitting the form below. If you are looking for a specif part number, please include it with your message.